There, that should get you caught up. I’ll try my best to post the next bit of news before the earth completes another orbit. Till then! My last news post was in December announcing the lottery results of the 2014 Winnipeg Fringe Festival, and here we are on the other side of it! Yeesh. But in my defense, there really wasn’t a whole lot happening between then and the start of Fringe execpt rehearsals, and who wants to hear about that? 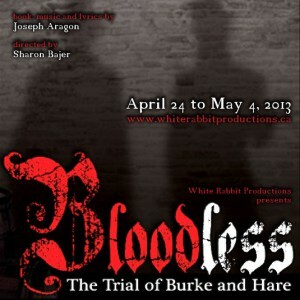 Anyway, the 2014 Winnipeg Fringe was fabulous, and the 10th anniversary production of BLOODSUCKERS! The Musical was a big success. We played to large appreciative houses, got a 4 1/2-star review from the Winnipeg Free Press, were designated the Patrons’ Pick for the Tom Hendry Warehouse, and — most importantly — made a profit! Huge thanks to everyone on Team Bloodsuckers for such a wonderful experience. Can’t wait for the 20th anniversary production. Next up: my first professional theatre scoring gig. I’ve been tapped by director Ann Hodges to compose music and design sound for MTYP’s production of Jabber, a play about a teenage Muslim girl navigating a new high school. Very excited about this one. Also, I’m still working on my commission for Prairie Theatre Exchange — a non-musical play provisionally titled How the Heavens Go about love, belief and string theory. Plus other top-secret things on the burner, including some new musicals! 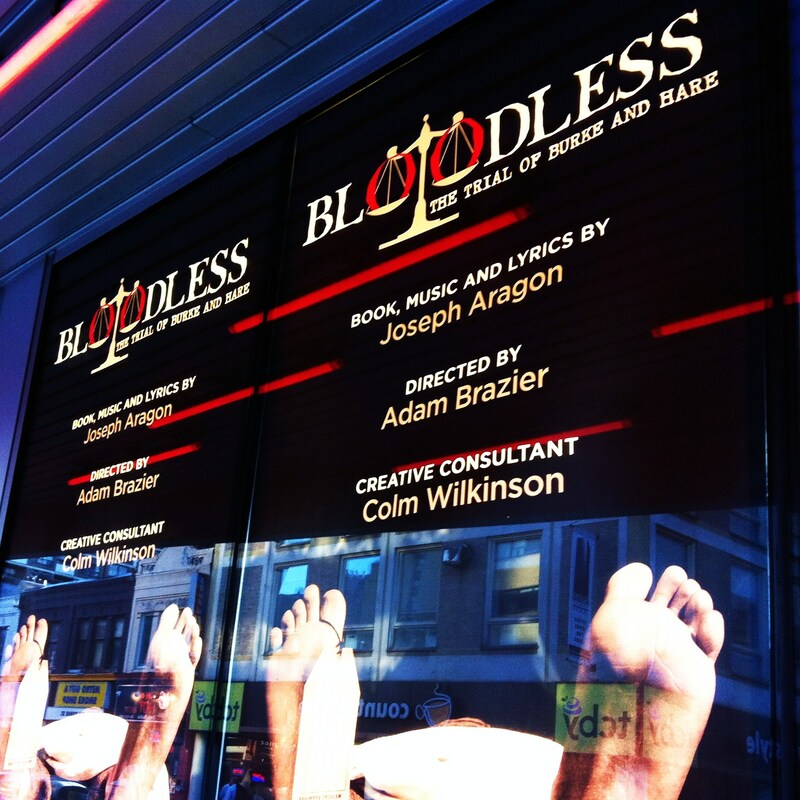 Bloodsuckers 10th anniversary show at the 2014 Winnipeg Fringe! josepharagon.com gets a face lift! It’s been three years since the last major upgrade to this site, so it was due for some changes. The new design is bigger, cleaner, lighter, and hopefully easier to read and navigate. I also added a new Design section to show off my graphic work. So please take a look around the site, read about my musicals and plays, listen to some music samples, glance at my portfolio, make yourself at home. I hope you enjoy the new look! Can I Stop Writing This Show Now? Long answer: Yes, for a while. 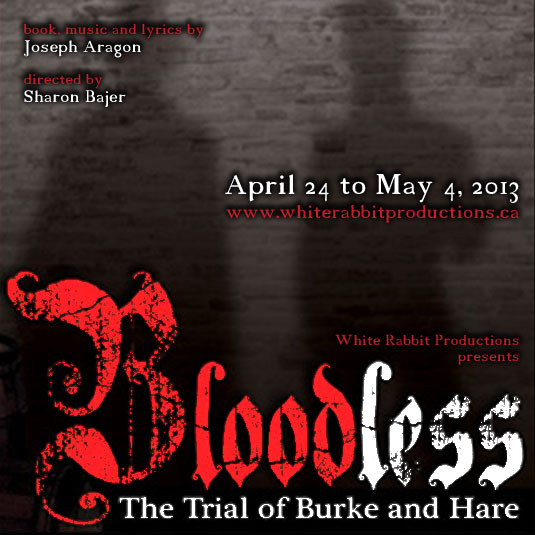 April 2013 has come and gone, and so has the third production of Bloodless: The Trial of Burke and Hare, lovingly nicknamed “Bloodless 3.0″ by the wonderful people at White Rabbit Productions, who remounted it. Significant changes were made to script and score since the Theatre 20 production in Toronto last October, including the addition of new songs and the restoration of old ones. It was directed by my longtime colleague Sharon Bajer, and presented at Winnipeg’s newest performance venue, Le Cercle Moliere. The space has modular seating, and was arranged in an alley-style configuration for our production. This made the show very intimate and immediate, with the audience facing each other and “becoming” the jury at the trial or the students at the anatomy lecture. “Bloodless 3.0” was well-received — Good turnout, good buzz, a few sell-outs, and a very favourable review in the Winnipeg Free Press. 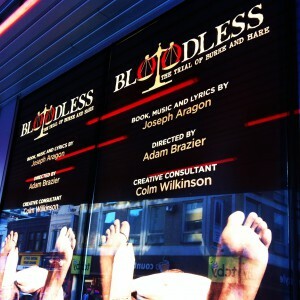 Even Adam Brazier, Bloodless’s Toronto director, flew in to see it and was very much encouraged by the show’s evolution. What’s next for it? Not a clue. There’s more work to be done towards version 4.0, but for now I’m content to take a little vacation from it and let it cool. In other news, if you’re an avid reader of The Sondheim Review (TSR), the quarterly magazine devoted to all things Sondheim-y, may I direct your attention to page 21 of the upcoming issue (Summer 2013). There you will find my disproportionately huge mug and about 1,700 words of semi-informed prattling authored by Yours Truly. I was approached by TSR to contribute an essay for their “Following Sondheim” series, where musical theatre writers get to wax with varying degrees of eloquence upon Sondheim’s influence on their work. The reason they would tap an unknown schlub like me to write an article for them is still a mystery, but — like any good Canadian — I was just happy to be asked. I think it’s an okay article myself, but had I considered that one of those avid readers of The Sondheim Review is Sondheim himself, I might have finessed it a little more. Oh well. All right… Due to the pestering of my ever-persistent friends, I have decided to write a running blog detailing my Bloodless experience here in Toronto. 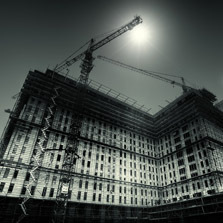 This blog will not appear on my main page. If you want to see it, go to my WordPress blog at www.josepharagon.com/blog. Yes, I’ve had a WordPress blog all along, but so far I’ve used it only as a convenient way to post news, and never as — y’know — a blog. I’ll try to post as often as I can, but I can’t promise to post every day, since I may be otherwise occupied with things like… oh, maybe working on my show. And I can’t promise it’ll be entertaining either. But hopefully it will satisfy everyone’s curiosities.